There’s something about art-related crime and intrigue that seems more thrilling than other types of crime. Whether it’s forgery, outright theft, or (on the flip side) stories of restitution or locating missing works, art crime and its respective resolutions always make it into the headlines. It fascinates our imaginations, and provides more than enough fodder for entertainment, from films (Monuments Men, Woman In Gold, Big Eyes, etc.) to books (The Goldfinch and Headlong, to name a few we’ve covered here) and beyond. So far, this year has proved no exception, as we’ve had plenty of art news to grab our attention. But, aside from Banksy, one artist’s name has popped up in more than one big story this year: that of Pierre-Auguste Renoir. From a theft this past week to the happy conclusion of a rightful restitution case earlier this fall, the Impressionist’s work (featured in our first, third, fifth, and sixth-grade curriculum) has found itself in the headlines once again. 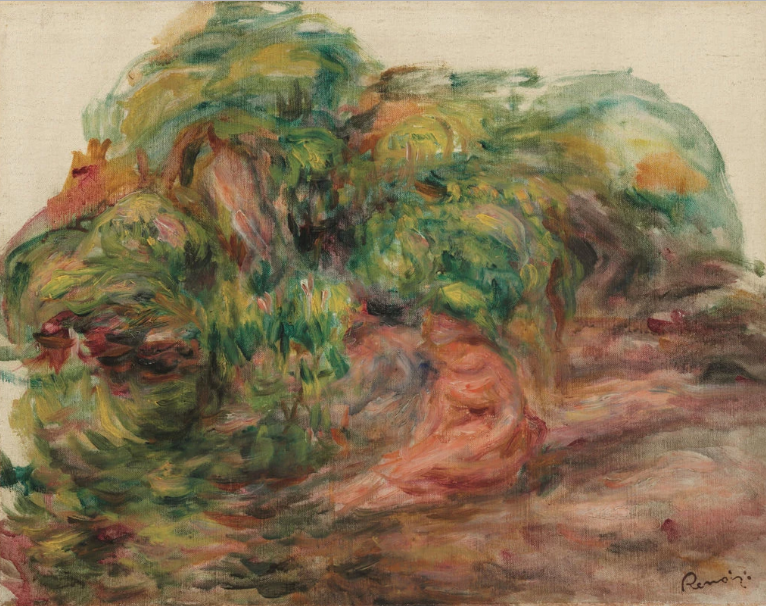 Renoir’s Golfe, mer, falaises verts, which was stolen last week. Image c/o Artsy via Wikimedia Commons. We’ll start with the bad news. This past week, a Renoir painting was stolen right off the walls of a Vienna auction house–a blatant, bold crime played out right under the ever-watchful eye of CCTV cameras. 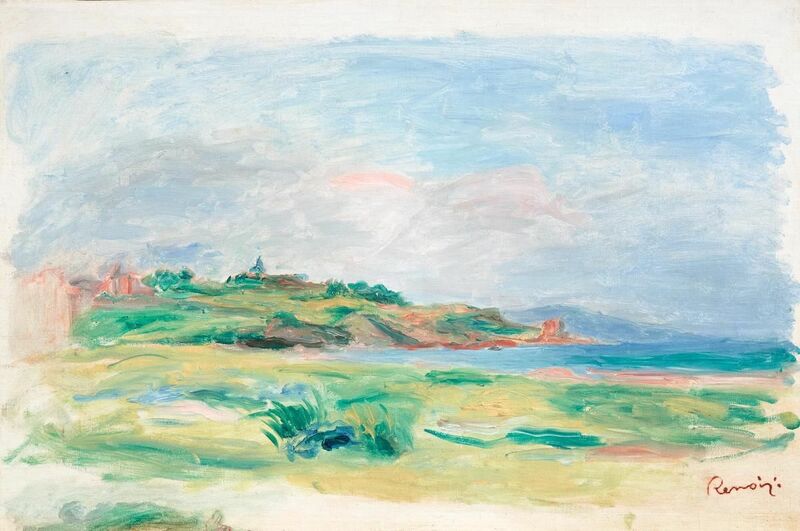 Estimated to have auctioned for at least 120,000 euros at Vienna’s prestigious Dorotheum auction house, Golfe, mer, falaises verts was instead removed from its frame and taken out of the gallery on November 26. Authorities are not revealing how the landscape was removed other than saying it was not cut, because, according to an inspector working on the case as reported by The New York Times, “we don’t want to give advice” to other would-be crooks. As of now, there are three men who police have labeled as potential suspects and are currently looking for. The Dorotheum has declined to comment any further than stating that the theft did occur. However, this is actually the second big headline a Renoir work has made this year. Enter the good news: Two Women in a Garden, painted in 1919, was finally returned to its rightful owner. Originally belonging to Alfred Weinberger, a Jewish art dealer and collector, the work was seized by the Nazis in World War II, according to Artsy and The New York Times. Weinberger, who escaped from the Nazis Paris to become a resistance fighter in the Alps, survived the war and filed restitution claims with the French and German governments for multiple paintings that the Nazis had looted to no avail. Renoir’s Two Women in a Garden was finally reunited with its rightful earlier this fall after being looted by the Nazis and shifting through various owners over the years. Image c/o The New York Times. Though nobody’s one hundred percent sure where Two Women in a Garden spent the war and the following years, it ended up in London, and continued on to a string of auctions in Johannesburg, Zurich, and eventually New York before anybody realized that its provenance included Nazi confiscation. After spending several years of going through the restitution process, Sylive Sulitzer, Weinberger’s granddaughter and heir, was finally reunited with the painting that is rightfully hers earlier this fall at a ceremony at New York’s Museum of Jewish heritage. That’s quite a lot of news on work from an artist who’s been dead nearly one hundred years. It just goes to show that the story of art and art history is ever changing–which is perhaps why it fascinates us so. Check out the full stories about the Renoir theft in Vienna and the return of Women in a Garden at Artsy and The New York Times. Interested in what we do? Discover more about the Art Docent Program and our curriculum here, and don’t forget to follow us on Facebook! Want more news about art intrigue and scandals? Check out our blog archives!